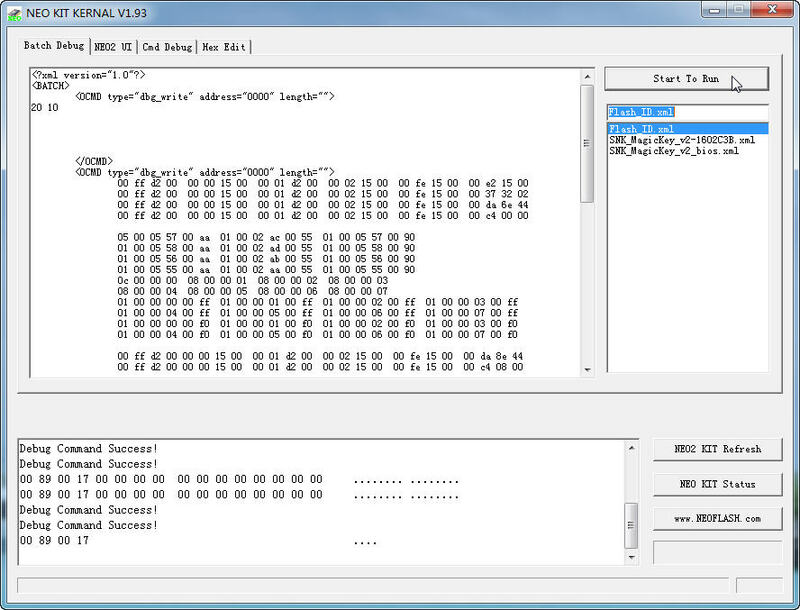 * Fixed the SMS4 can't support special symbol with the nds cart title name like "/" & ":" when try to dump the NDS cart. * Now can detect the NEO3-SD cart and show in the bottom status line, but need to use "Menu Write" function to write the data to it in the "Memory" section still. * In the PC-E section, changed the "USA" option to "USA-TG16", to avoid make USA user confuse. How to use the "NEO2 Kit Kernal" to upgrade the Neo SNK Magickey menu? Just bought a N64 Myth and neo2 Pro bundle, and a neo2 twin bundle. 1) When I install the Neo2 Pro Manager 1.30 I get a virus alert on C:\Program Files (x86)\NEO2\Manager\GBA\PVRomPath.dll indicating RDN/Generic.dx!cls Trojan. Is this expected behavior? 2) When I try to format the Neo2 in the Neo2Twin bundle which is formatted as MD from the factory to GBA I get a USB timing out error. How do I fix this? 3) When I tried to install Neo2 Pro Manager 1.32 I get the same virus alert, but also get a new error about trying to open D:\SNK_MagicKey_main.bin, however, I do not have a D:\ drive. Is this expected? 1. it's not the virus , don't worry about it, just bypass directly. if you don't think so, you can upload these files to the virus identify company to get the judgement. 2. you need plug the USB cable to the backside mother board USB port directly, don't use any USB extension cable. 3. the manager need copy some files to D:\ , if you don't have D driver , you can ignore this warning . I tried the slimloader in both the front and back USB port, as well as, both USB 2.0 and USB 3.0 ports on the motherboard, but no change in the result on the Win7 machine. The only way I could get it to work was to revive an old XP laptop with only USB 1.1. I just got the SMS4 to backup my carts, howeverI am noticing some issues. The first day I backed up 3 pokemon carts: HearthGold, Black, and Black 2. Today when I connect the SMS4 I get a new NEO2 Pro Error window saying Unknow NDS SMS. Is this normal or an issue with the software or is the brand new hardware having issues? normally it's the connection issue, you need clean the nds cart golden finger, it's too duty. If I switch to the NEO 3DS&NDS SMS2 Backup Master V1.26 software it can read the save file for the CARTs that show SMS Size(Kb) 0. 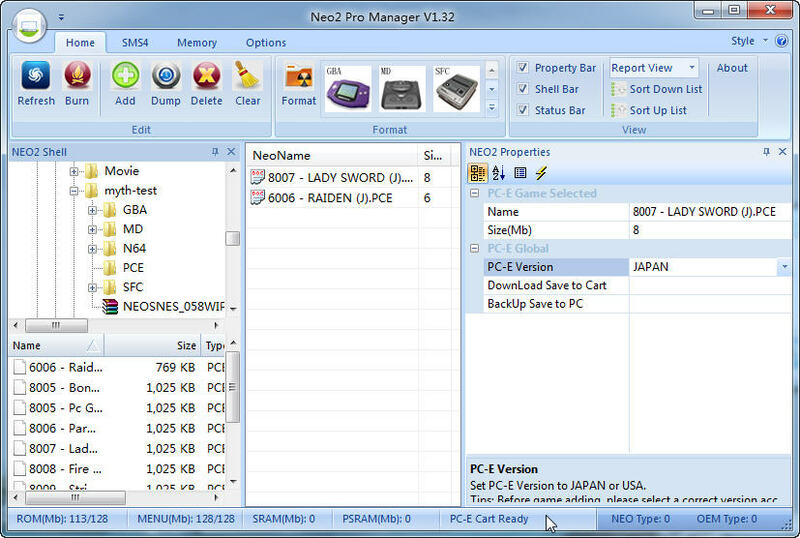 Is the NEO2 Pro Manager software more sensitive to the connector cleaning than NEO 3DS&NDS SMS2 Backup Master V1.26 software? I will try cleaning the connectors with 90% IPA, but it seems odd that 12 different carts have the same issue, is it possible the issue is on the SMS4 connectors instead of the NDS CART connectors. If so, how do you clean the SMS 4 connectors? Is the NEO2 Pro Manager software more sensitive to the connector cleaning than NEO 3DS&NDS SMS2 Backup Master V1.26 software? --- please don't use neo2 pro manager to run the SMS4, the master v1.26 is the right choice for you. and the SMS4 is new kit you just got, so i don't think you need clean the SMS4 slot, but you can try to use some pure alcohol to clean it, maybe can help too. I just tried it and it works. I have found that you need to be login and then refresh the page after login in to get some of the links to work. does it work with Windows 7 64bit without any issues? I have this error when I want o burn a rom see attachment! yes, i'm using the win7 64bit now,everything is ok.
and you need install the new microsoft .NET also. well thanks for your response but I still got this error? !